The Marcedes Lewis Foundation was established by Marcedes Lewis to support the youth in our community. His love for children and the achivement of a childhood dream prompted Marcedes to start his foundation. The goal of the foundation is to award scholarships to youth in the community who otherwise would not be able to participate in youth sports such as football, baseball, basketball, volleyball, soccer, etc. The scholarship recipients will be required to maintain certain academic standards and report to the foundation periodically. The foundation will follow each recipient through his/her youth and high school years in the hope of being able to assist in any needs he/she may have as they enter college. The ultimate goal is for the foundation to grow to a point to support sending a child to college on a full ride. The college recipient would also have requirements that would have to be met to receive a scholarship renewal each year. One of the many goals of the foundation is to award scholarships to youth in the community who otherwise would not be able to participate in youth sports such as football, baseball, basketball, volleyball, soccer, etc. The scholarship recipients will be required to maintain certain academic standards and report to the foundation periodically. The Marcedes Lewis Foundation supports our youth with small scholarships for participation in activities such as football, baseball, volleyball, dance, and physical activities that may just be out of reach for some families. With these activities available to them, they give children a vehicle to see the big picture, possibly college in their future. Our goal is to help support our youth as they excel in school, whether it’s elementary, middle school, or high school, and hopefully even college. We’d like to offer grants for books and materials that our participants may not be able to afford. Our ultimate goal is to offer small college scholarships to deserving students on an annual renewal basis if all academic requirements are met. We hope that you will be as passionate about this most important Foundation and support our youth year after year. Your contribution will support many events enabling children to be a part of something meaningful. We would like to thank you for taking the time to visit our avenue for support. We look forward to a partnership with you and your organization to help us meet our goal of allowing hundreds to thousands of youth to participate and enjoy being outside and active while learning something and mingling with other children in the community. As a non-profit organization, any and all donations are tax-deductable, and any donation is more than appreciated by the Marcedes Lewis Foundation and the youth it supports. The purpose of our events is to teach young minds that there is more to life than just football and other sports. We promote the concepts of embracing discipline, teamwork and the importance of education. All too often we lose focus on what’s important. The most important thing in life is the future of our children. 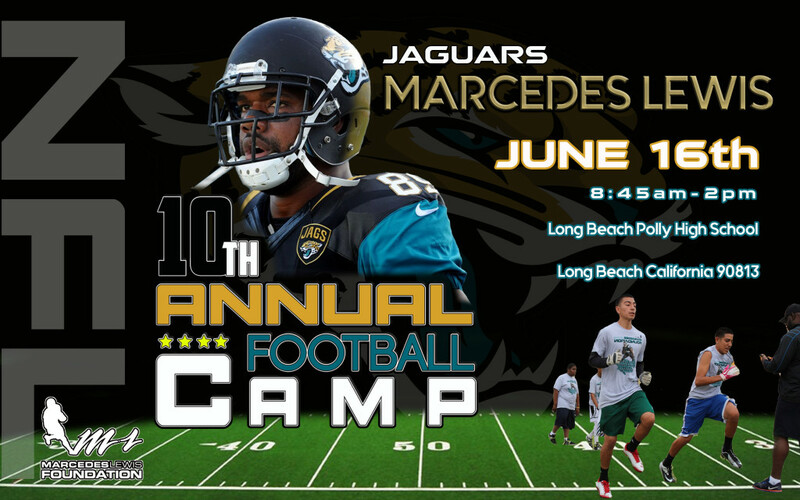 The Marcedes Lewis Football Camp has been a huge success for the past few years! We have caught up with all of our old friends and made so many new ones. Be sure to mark your calendar for June 16th in Long Beach to join in on the fun. Since camp is free of charge, we ask local businesses for support. Everything from monetary to in-kind donations are greatly appreciated. The generosity of our local community is vital in making this annual event a success. Thank you very much for your help in making these camps possible! Join us for an incredible night of fun and fundraising for the kids of the Marcedes Lewis Foundation. Last year’s Football Camp welcomed over 550 children from the surrounding Southern California communities. We are looking forward to serving even more children with your help and continued support. 100% of the proceeds from Casino Night will go directly towards the 2016 MLF Football Camp. Individual tickets are also available for purchase. Thirty young people from the Boys & Girls Club of Long Beach, the Boys & Girls Club of Pasadena, the Boys & Girls Club of Santa Monica and Challengers Boys & Girls Club on seven boats will test their sailing skills. The regatta is held as a benefit for the Boys & Girls Club and the Long Beach Sailing Foundation, which provide inner city youth enriching and educational opportunities. This event is FREE and open to public spectators. Learn more at the Marcedes Lewis Foundation.